Tulsi leaf has been known as Holy Basil for thousands of years, as even its presence is purifying and satvic (peaceful) in nature. In India, this sacred plant is often kept in each family’s house or yard, allowing it to bestow its blessings onto each home. It is used as an offering in holy Hindu rituals and is thought of as the Earthly manifestation of the Goddess Tulsi, a consort of Vishnu. Although said to be spiritually cleansing, the presence of the Tulsi plant is also physically cleansing, as it is known to absorb positive ions and energize negative ones; clearing the air of dust, mold spores, pollen, pet dander, odors, cigarette smoke, bacteria and viruses. Tulsi is a very versatile and powerful herb, allowing its healing properties to cover a wide range of areas. As already mentioned, the physical presence of the plant cleanses energy and the environment; but when taken internally, this herb can heal a wide range of imbalances as well. 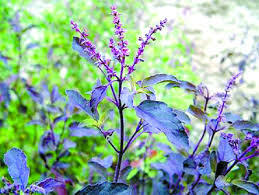 Tulsi is a commonly used herb in the world of Ayurveda, and is now becoming more well known here in the West. Although Tulsi can be powerfully healing, it is said to be satvic (peaceful) by nature, making it suitable for all body-types in moderation (will increase Pitta in excess), with no known side effects. 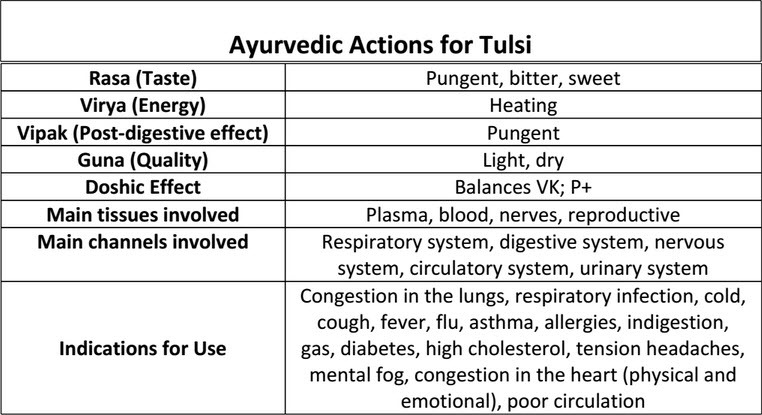 Tulsi can be utilized in several different ways depending on the needs of the individual. An easy and effective way to incorporate Tulsi into your daily routine is to simply sip on Tulsi tea throughout the day. You can make a large pot in the morning and drink off of it all day long. For treatment purposes, I generally recommend taking 1 cup of Tulsi tea, 3-4 times daily. 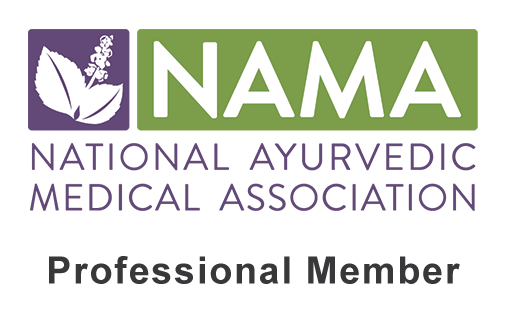 For Vata types you can mix Tulsi with fresh ginger to make a tea; for Pitta types try mixing with brahmi or rose petals; and with Kapha types try dry ginger. For a lovely tri-doshic blend, try our OM Shanti Tea! Boil 4 cups of water and then turn the heat to low. Add 3 Tbsp of Tulsi and steep for 8-10 minutes. ***Add any additional herbs during this time if desired. Strain into a pot and drink 1 cup 3-4 times a day. 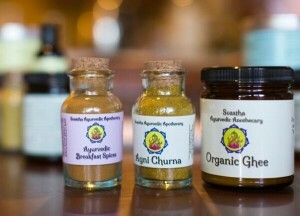 Click here for our “Tulsi, Turmeric and Ginger Tea Recipe”. Great medicine for treating and preventing colds, cough, flu and fever! Tulsi can also be used in the form of a powder, taken solely or added to an Ayurvedic formula. This is a great way to get a larger, more consistent dose of Tulsi, allowing its healing properties to become more potent. With the addition of other “like-minded” herbs, Tulsi becomes even more powerful still. Try our Mind Tonic tincture!